Saturday. 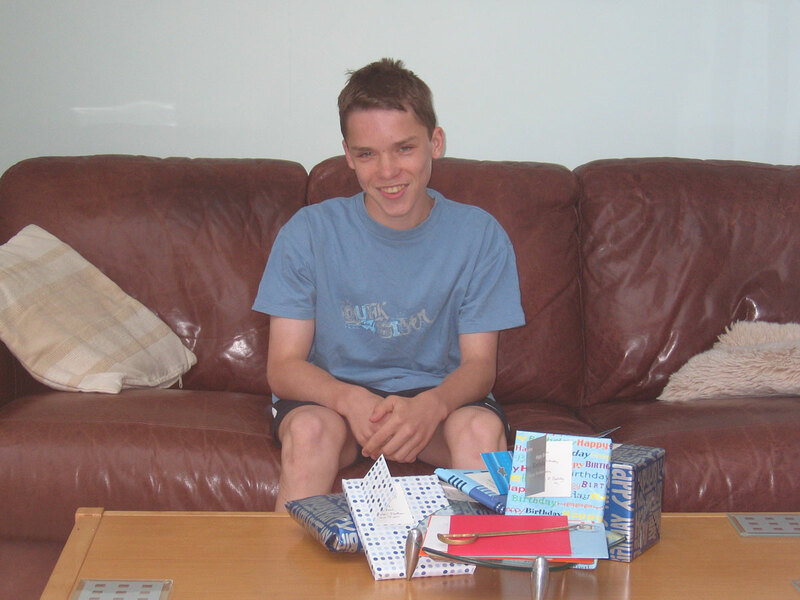 Adam's fifteenth birthday. We all had to get up at around 7.30am so we could do the traditional birthday present opening photo shoot. Adam did quite well this year, as ever. Cards and presents galore. We gave him a PS3 game, Virtua Tennis, and the new Day-Glo yellow Chelsea away kit - shirt, shorts and socks. He got an E-dog, Hot Fuzz on DVD and a strange contraption hat allows you to convert a PS2 controller into a PS3 controller. so there you go - he also got about £50 in cash from various relatives. The major task for my day was Mission Ball Dress and I am delighted to announce that it was mission totally accomplished with bells on it. Richard came into Guildford with me and we ended up shopping for bits a pieces for him first at Fat Face the ski and surf trendy shop. I bought Adam an Oakley shirt from there but then we hit House of Fraser. I headed straight for the Evening gown section and I selected three Gina Bacconi dresses to try on - all in my size apparently - I was doubtful. My favourite of all - the one that wasn’t 40% off in the sale - looked like it had barely enough material to be a size 6 let alone the 12 that I was hoping for. I tried it on first and it was perfect. A perfect fit - the first time ever something like that has happened to me and it was just gorgeous. It was going to be mine no matter what. I tried on the other two sale frocks and they both fitted too but they were different styles and they didn't flatter me in any way. So I went for the mushroom and cerise gown that I saw first. I then spent the rest of the morning purchasing matching shoes, pashmina and evening clutch bag. We then went to lunch at Wagamama's - I had a fantastic salad before getting Richard a new outfit - shorts and tee-shirt from Next before heading home. We only had an hour before we had to go into Woking because Mark had an eye test at Boots Opticians - his prescription has changed in only six months so he had to have another pair of glasses - great. We also collected Adam's birthday cookie from Millies. Four of Adam's friends came over for a birthday barbecue tonight - the rain was sheeting down so they all ate indoors in front of the Playstation. It was the series finale of Dr Who tonight and what an ending it was. Brilliant. Sheer theatre. We cannot wait for the next series now. Absolutely amazing. So ended the glorious month of June - it looks like it will go on record as being the wettest in England ever. Global warming. Global wetting. Last year we were having one of the worst droughts we'd ever had. Who would have thought it! Friday. Last day of our financial year at work. A few bleary eyed people at work this morning, just a little worst for wear. A very busy day but I think that I am all set for Monday. Adam after all his efforts last night and in the early hours managed to leave his Geography homework at home today. Arghh! Thursday. It was our year end do at work this evening. We all went to The Duck on Battersea Rise in Clapham, just a stones throw away from Elspeth Road where my Granny used to live, more than 20 years ago now. It was a great do people wise and the pizzas were fabulous but I wasn't impressed at all with the pub downstairs toilets. Infact I would go so far as to say that they were the worst toilets that I have ever seen in a pub. Shocking. Pub interiors have changed a lot since I was a bright young thing. It is all wooden floors and brown leather sofas and open plan - a bit soul-less really. We used to have character - now we have interior designer but it all looks identikit - people decorate their homes in the same modern minimalistic way-- but it all lacks wild imagination. It's nothing special and that was The Duck. In spite of that it was a good night out and a good get together and I am glad I went. I did have a few drinks - sparkling wine and then some Pimms and when I got back to Woking, Richard came and picked Natalie and myself up. I got home and Adam was still working on his Geography course work - infact he didn't complete it until 1am in the morning Friday. He said "I didn't think it was going to take me this long" when I got home but at least he did do it. I hope that he has learned something. Wednesday. Barney and Sue had their baby boy at 4.30pm this afternoon. Very exciting. Very manic day at work preparing for next week's new starters. Tonight watched 2 more episodes of Brothers and Sisters. It is brilliant. My Wednesday nights are completely sorted now. It is so good and I even watched next week's episode on E4. Tuesday. Still not feeling great but I did get to work on time today. Lots of emails from Barney. Looks like the baby is coming today - very exciting - just waiting for news now - of course it means all the plans for this week and next have gone by the way side but such is life as they say. The weather is very cold at the moment for June and up north they have had very serious flooding - Sheffield is particularily badly hit. they have had 1/6 of the years rainfall in a day. I have never seen such flooding. It must be dreadful for all the homes and businesses affected. Global Warming takes some beating it has to be said. I finally got round to watching Brothers and Sisters tonight. It is amazing - like a cross between 30something and Ally McBeal -with all the old faces etc. the writing is superb - I feel like I have died and gone to heaven. Wednesday nights from now on are going to be absolutely brilliant. Monday. My alarm went off at 5.50 am and I still felt rough. I couldn't get up, my head was still bad and my stomach still felt unstable although I hadn't been sick in about 6 hours which meant I did get to sleep through. I took some paracetamol and went back to bed fro an hour and then I got on gettign the boys clothes ready. They had to organsie their own breakfasts and sort out their lunches - I went back to bed until 8.30am and then I felt well enough to go in to work so I got up and made it to my desk at about 9.30 in the end. I wasn't at my best to start with but I downed some toast and orange juice and made it through the activity reports and later the conference call. I also got the stationery ordering- so I achieved all my objectives for the day - not feeling my best at all. I got back from work quite tired and still not 100% so I didn't go to my writing group tonight and just took it easy. Wimbledon started today so I watched a bit of that. I sw Tim Henman not win his match - he hasn't lost it either but he has to go on again tomorrow 2-2 and 5-5 in the final set - and I've seen him not get through one of those sort of mathches before so he lives to fight another day - but only just. Oh well. Sunday. A very wretched day for me quite literally. I was so sick today. I started throwing up at about 8.00am and it went on unrelentingly until about 11.00pm when I went to bed. I actually didn't get up at all, all day except to have a bath in the evening to freshen up and then to watch the News before retiring still being sick. I had to resort to taking some of my anti-vomit tablets tonight - I noticed on the label on the botle that they were prescribed for me in 1993 - I didn't expect them to work and I'm not even sure if they did because I was still sick several times after taking them. I'm convinced it was the onion bagees from last night - don't think that I'll be having those again for a while I can tell you. Poor Richard had to do everything for the boys today. He did succeed in doing Sunday lunch - roast chicken legs with roast potatoes and carrots - single handedly so I was impressed - not that I intend to make a habit of it - being incapacitated like that - I hate being sick it is just the worst feeling in the world - the headeache like a vice-like grip and the all comsuming nausea that just never seemed to stop. I didn't know if I would get any sleep in the night. Saturday. A busy day with of and on miserable weather. I got the washing done but not hung out and we had a family shopping to Woking where we hit TK Maxx with a vengeance andgot Adam and Mark kitted out with more tee-shirts and shorts for summer and their forthcoming trips to Paris and Newquay. I broke away for a bit and went posh frock shopping. I tried on a dress for my ball in Debenhams but it was horrible on me - a J Taylor affair - I was not impressed but I did buy a couple of nice summer evening tops from Wallis for taking to Rome with me and they will do for Centre Parcs as well no doubt. The highlight of Saturday night was Alan Edwards 50th Birthfay PArty at the Bisley Pavillion. It was fun and a good chnace to meet up with a lot of the old crowd - Mandy and Paul and Steve and Mel were there and we shared a table with them. The buffet was my downfall and I think the onion bagees were to blame, no sooner had Ie aten them when my stomach felt funny and they were repeating on me all night. I was tired when we got home but didn't think I had over indulged in either drink or food and I was dancing until the end also. It was a good night out. Friday. I was so tired tongiht when I got backfrom work that I volunteered Richard to cook dinner - so it was a carbonara night. It was very good - we had to wait for Mark to get back from tennis but it was worth the wait. The Longest day. The shortest night. Midsummer's day. Whatever. Lucky me - I got to spend the bulk of it in Redhill. I didn't even bother to venture out at lunchtime such is the hell hole that is the towncentre. Redhill ain't my kind of town. Got a phone call thismorning from Adam's Geography teacher. He is not being very forthcoming with handing in his Geography course work. She is getting worried. Now I am getting worried. I spoke with him tonight and it is all a fuss about nothing and he has handed it in - late - because he didn't have time - I don't know what he has been spending his time doing but it certainly isn't working. He is so difficult just now. I try and have a conversation with him and he won't look me in the eye and is all shifty and can't wait to get away. I will inspect his work when Richard is back and we will ban him from Runescape - close down the account if necessary if he doesn't start knuckling down - 99 Agility or not. Notl3y989 or whatever you call yourself - your days could well be numbered. Wednesday. Argh. No Apprentice. What a void to be filled my wednesday night's now. I had to busy myslef with sorting out all the Pampered Chef orders that were delivered today. Got all my stuff too. The bamboo spoons are just brillant and can't wait to start using my bar pan. The difficult part will be getting all the orders out. This stuff is not light to carry. Tuesday. Have bought fabulous silk chiffon tunic top from Monsoon to wear to Party this Saturday night. 50th Birthday party no less - kind of worrying that members of circle of friends are starting to turn 50 - but back to the dress... It is red and black and white - very nice. Also got sleek capri pants - black - from Dorothy Perkins - actually they called them cropped trousers but it is the same thing - and far better for me then some flimsy leggings as far more flattering. Now have to be on look our for something to wear to the Ball on Friday 6th July. This will likely demand a trip to Guildford on Saturday. Have seen a French Connection dress in You magazine - in purple - that I quite like - probably totally unsuitable as was very long and thin and not even pictured worn by a long thin model - which is always a bad sign but it wasn't a prom dress. I am vehemently anti prom dress just as Iam vehemently anti smock top and leggings - not clever dressing - would be far too mutton on me. Monday. Monday - sometimes it just turns out that way. As it happens it was a good day. I was tired after the weekend and it was my turn to lead the Scribes. Neil Gaiman to the rescue and his Other People. It wasn't hell after all- but a very lively discussion. Sunday. Hopefully Richard and Richard had a good Father's Day. Camping last night - cooked breakfast this morning and then spending all day at the Lake and getting some waterskiing and some wake boarding in. The boys loved it. Wendy and I had a lie in and made our way down to the lake after lunch and spent the afternoon there. The wather was a little better today - no showers in the daylight hours. I've come home a touch sunburnt I think. We didn't get home until about 8.30pm and we ordered through a take-away from the Khyber Pass which we picked up on the way home. We are all exhausted from the exhilaration and/or the fresh air. The house is a total tip and I have to be prepared for Yvette cleaning tomorrow and we are all too exahsuted to clear up properly. Everyone got on really well this weekend and so we are now really looking forward to CenterParcs in August. Saturday. Fabulous day. we went to see Richard and Wendy in Bedfordshire today. The weather wasn't great but at least the guys were able to go camping at the Lake at Stewartby and Wendy and I had a girl's night in in Barton-le-clay. Very enjoyable. It's Wendy's 40th on Monday and it is Father's day tomorrow - so this is all in preparation. Friday. End of the week. Most significant thing. I prepared prawns with Chilli dipping sauce for tea and we had a noodle stir fry. we are going away for the weekend tomorrow. So I had to get all the weekend wahsing doen tonight. Which I did. Thursday. The welcome return of My Name is Earl. Such a fine comedy show. Wednesday. The Apprentice final. Simon Ambrose won. I had wanted it to be Kristina but she was very gracious in defeat. She will go far. Tre was the funniest - very good sense of humour. Good luck to Simon in any case. He is welcome to his job with Sir Alan. Kristina will win through now in whatever she does. Tuesday. No more to say. Busy day at work. Arguements tonight with Adam and Mark Adam had his RE exam today. He's so indifferent about everything and so big and strong. Too big now to send up to his room by force. All that can be used to get to him now are words. There will be many of them in future I am sure. I just hope that he did enough work in the end. He was up until 11.30pm last night revising - finally deoing what I had begged him to do all weekend and everyday for the last few weeks. It's all a big joke to him. Time will tell to see if his gamble has payed off. Just an other manic Monday. I finally caught up today on all of my reporting etc but I have so much else to do. I will be very very busy tomorrow that is for sure. It never ends. I went to my writing class this week. I got the rsults of my poems for Slough. I got 2 commendeds. The Pancake went down very well. Nothing bad was said about anything so that was good. Sunday. A good day. Joseph tickets booked. I am going with Richard for my birthday treat. We have got two dress circle tickets for Monday 8th October. Very exciting. I booked up this afternoon and there were hardly any seats left. certainly not on Fridays or Saturdays. So Lee had better not let me down. This evening we booked our ferry and hotel for two nights on the way to Centreparcs in Holland. we are goign to go via Bruges. Have found a nice sounding hotle in the centre so we shoudl be able to explore, see the sights and also take in some of the first world war battlefields and war grave sights. I am looking forward to it. Yes Hurray!! Lee Mead won "Any Dream will Do." He is Joseph. Just as I had hoped and I am so going to go and see him. It was an exciting show tonight. Lewis went out first and so it was between Lee and Keith. I voted for Lee three times in the end. He sang Paint it Black again tonight and it was amazing. I can't wait to go and see him. Will have to book tomorrow. Today was a lovely day weatherwise and I got all my washing done and planted out the new pepper plants that Richard bought me. The garden is lokking stunning now. Very pleased. We had a barbecue tonight and then I settled down for the Jospeh final - absolutley brilliant. What will I do with my Saturday nights now? Probably be willing to go out once again, that's for sure!! Friday and OMG was the last Ugly Betty of the season tonight and so so sad. Lots of scope for a new series though. Cannot wait and bring it on. Am sooo tired tonigjht. Has been the busies week of my life workwise and I never did manage to catch up with all my reports in the end. Should be done by next week I hope. Thursday. The last episode of Hustle tonight. It was a goody. not quite sure what I will do with my Thursday night's from now on. A very good show. Wednesday. The day of my Pampered Chef show. Didn't go too badly. Didn't have a huge turnout in the end. Claire was unwell. Natalie was unwell and Tiffany, Anna, Natascha, Helen and Andrea and Sam couldn't make it. but I did have 5 attendees and they all bought something and so Joy wasn't too cross with me I don't think. It was also the semi-final of The Apprentice tonight. When 5 became 2. Very dramatic. Lohit and Tre were fired. Katie was told she was in the final and then before Sir Alan had to chose between Simon and Kristina - Katie stood down. The alpha female to end all alpha females couldn't commit to relocating her children from Devon. She wasn't fired but there were fireworks on the Your Fired program afterwards. Michelle - bra lady from the Gorbals totally laid into her and told her how much the nation hated her. Wrong Michelle. Katie totally kept her cool and the only one I ended up hating was the rapid Michelle. Remind me not to purchase any Ultimo bras. I didn't like Katie. I'd never trust her but I admired her composure under pressure. She is a true class act. The only class that bra lady demonstrated was totally working. I think I'd work on my presentation if I were her. Grace under pressure and maintenance of self dignity at all times are truly more important than sticking the knife in and coming over like a playground bully. Tuesday. What a day. The first of many spent buried in an Excel spreadsheet no doubt. There is just so much to do. Can't see an end to it. I am so tired. Endured a full on day long training course today. Haven't had any formal training for some while and this was like having a very concentrated burst. It was good but intense. Lunch was provided but someone opted to provide rather too many fish sandwiches and those that weren't fishy were on white bread - not my cup of tea at all. I got a car parking ticket until 7.00pm and it was just as well bcause I only just made it back to my car in time. I think I will sleep well tonight except that my head is absolutely buzzing. It is exciting now - I will be giving Best Practice Training to all the administrators in the patch. It was Train the Trainer Traning. It was good and it was great to do something different for a change. It was all classroom based I didn't login or pick up any emails at all so it was a total break from routine. we had a bit of an issue with Adam today. He was ill apparently - sick - although I remain to be convinced. He didn't go to school and I was not happy. Soem thing doesn't quite ring true. wortst of all Richard did not contact the school so we didn't notify them and even more worryi9ng - the school diddn't follow up with any of us to find out where Adam was/ all in all not very satisfactory. Adam will go back to school tomorrow - I have made it very clear that I expect better of him and he did seem quite subdued tonight. Guilty or off colour? The jury is out. Howeverm, he managed to eat a quarter of a pepperoni pizza. I rest my case. Today was lovely weather again. Hazy is loving his times in the garden and it is so nice to be able to open the doors and windows once again. We had breakfast, lunch and dinner all outside today. the garden and patio are now all tidy and geared up for al fresco living once again. I did a bit of weeding and tidying out the front today and I sewed soem of the basil and pepper seeds that I bought last weekend some in pots and some direct on to the herb bed. We shall see what comes up. Its back to school tomorrow fro the boys - the last half term of this school year. I go back to school myself tomorrow somewhat. For the first time in ages I have a training course and I am not the one giving it for once. It is "Train the Trainer" and I am looking forward to it. It is also Week 1 tomorrow which is mega reporting week - the cycle begins once again. I hve 4 days to cram in 5 days work. But I'll manage. I will have to go to Redhill at some point too but I'll try to make it nearer the end of the week so I have time to catch up. A gorgeous day today. We got all the gardening done - hurrah. Have planted out all my new plants and have potted all the chilli and pepper plants bar one - need a new pot. It is all looking good. Hazy had his first taste of garden life today. It was too hot to keep all the doors and windows closed so we had to leave them open and inevitably Hazy went out to explore. He managed to get stung or something and his paw swelled up to twice its normal size and we thought we would have to take him to the Vets but luckily it subsided and he was fine. Ke must have spent mots of the day out in the garden - he loved it. I had my hair done today and am really pleased with the result. I had exactly the same style as normal and and it coloured again today abd somehow the cut looks different. Edgier or something - I'm delighted. Set to go back again on July 21 which is the day after the boys break up for their summer holidays. Watched "Any Dream Will Do" tonight - it was the semi-final. It was very good. Lee was good as usual. Lewis was brilliant. Keith was Keith and so not Joseph to me. Too goofy. The sing off was between Ben - who should have gone out on the first show in my opinion and Lewis who has such depth and he is only 17 - although he will be 18 next week apparently. At last Lord Lloyd Webber saw sense and got rid of Ben and Lewis went through. Is be happy with either Lewis or Lee. I really don't want Keith. I woudl not pay to see him but I woudl go and see either of the others.We'll have to see what happens in next week's final. It is June. Summer. Allegedly. It wasn't too bad today. I went to Guildford to The Mount Alevernia Hospital and it didn't rain. Infact it was a very pleasant, if a little steep walk up the hill to the hospital but the view from the top, above the Castle car park was quite stunning. I spent ages at the hospital. Well over an hour - my first consultation with the Physio - it was all interview and note taking today and next time it will be an internal exam but it was fine. I go back on the 19th of June and I will have to do a Mark and record and measure everything that goes in and comes out for a period of 4 consecutive days. I have until 19th June so I may do it next week end. Tonight I took Hazy to the vet for his second vacination injection and it went fine. Hazy is doing very well and he's all done on that front now and just needs to have a booster next year and when he is six months old he can have his neutering operation and his microchip fitted. We don't want to lose him.